Well, finally, I am home. I am tired. It sounds crazy, but the last two days I really didn’t get much knitting done. What with the scavenger hunt, Fish Tycoon, yada yada yada, plus our big homework assignment not being due until Friday afternoon (which I procrastinated up until Thursday night), I used any spare moment to knit away on my socks. Here is Ringo, the Drunken Party Monkey in his Yellow Submarine. 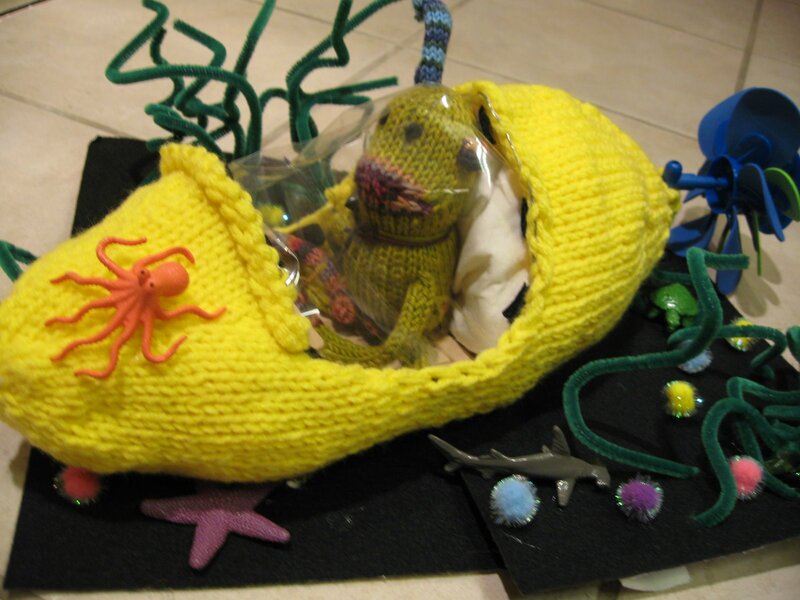 He is in a kelp bed surrounded by sea creatures and little anemones. there were all kinds of sea creatures. As soon as we get the Flickr page up, all of our Camp photos will be available to view. Until then………….happy knitting!